Congratulations on finishing one month in the journey of reading the Bible this year!! I have been thinking about the over arching story of the Bible. As we journey in the Bible this year we will see narrative sections as well as prescriptive sections. The narrative portions get the big billing since they tell the “story,” but don’t just skip past the other sections. There is some good stuff in there. Just over 40% of the Old Testament is devoted to telling the narrative story. The following Old Testament books are largely or entirely composed of narrative material: Genesis, Joshua, Judges, Ruth, 1 & 2 Samuel, 1 & 2 Kings, 1 & 2 Chronicles, Ezra, Nehemiah, Daniel, Jonah, and Haggai. Also, Exodus, Numbers, Jeremiah, Ezekiel, Isaiah, and Job contain substantial narrative portions. People like stories, and the stories in the Bible are important. They are purposeful stories that tell the historical events of the past and are intended to give meaning and direction for a given people in the present. There is a difference in the Bible’s stories for they tell God’s story. As the book How to Read the Bible for all Its Worth says, “The Biblical narrative tells the ultimate story—a story that, even though often complex, is utterly true and crucially important. Indeed it is a magnificent story, grander than the greatest epic, richer in plot and more significant in its characters and descriptions than any humanly composed story could ever be.” (How To Read the Bible for All Its Worth, p. 90) Enjoy the stories and remember to try to see the overarching story of God’s love for his creation and his desire to save us from sin. Before the first plague Moses and Aaron have a confrontation with Pharaoh and his magicians. We see here that Pharaoh’s heart became hard and he would not listen to them. By looking at the first nine plagues in groups of three we can see some interesting things. In each series the first and second plagues are announced to Pharaoh in advance. The third is given without previous warning. The series of 3 x 3 leads up to a climax in number 10—the number that is the symbol for completeness. Within the plagues themselves there is a progression, an increase in severity. The last three are especially severe and destructive. The Egyptian magicians vie with Moses in duplicating the first two plagues. At the third they try but no longer succeed in their magic arts. They must confess, “This is the finger of God.” Beginning with the second group of plagues (4,5 & 6) a distinction is made between the Israelites and the Egyptians. The land of Goshen where the Israelites live is spared. The first nine plagues deal with phenomena that have to do with nature. Since the Egyptians worshiped the powers of nature, what more effective way could God display his power over all things, which they looked upon as deities? The tenth plague was the plague of the firstborn. With this plague all the first-born were to be killed. But the angel was to “pass over” the homes of the Israelites. The Passover presents to us one of the most important Old Testament types of the Savior Jesus Christ. As we look at the directions for preparing the Passover meal, we see step by step how the entire ritual points to Christ, our Passover lamb. The Passover lamb was to be a year-old male. John the Baptist tells of the Messiah who was to be the “Lamb of God, who takes away the sin of the world." In Corinthians, Paul says, “For Christ, our Passover Lamb, has been sacrificed.” God directed that this Passover lamb was to be “without defect.” Peter wrote that we were redeemed “with the precious blood of Christ, a lamb without blemish or defect.” The Passover lamb was to be slaughtered as a sacrifice. Paul reminded his people “Christ loved us and gave himself up for us as a fragrant offering and sacrifice to God”. The writer of the book of Hebrews repeatedly refers to Christ as an “offering” and “sacrifice”. “Do not break any of the bones.” This was direct foreshadowing of Jesus. The Israelites were to “take some of the blood and but it on the sides and tops of the doorframes of the houses.” God said, “When I see the blood I will pass over you. No destructive plague will touch you when I strike Egypt.” This points to the teaching that we are redeemed from the power of sin, death and Satan with the precious blood of Christ, a lamb without blemish or defect. God tells the people that they are to remember the Passover for “generations to come”. I hope you can see how the Passover celebration is important to our understanding of who Jesus is and how he is the culmination of Gods redeeming work on earth. It is no coincidence that Jesus celebrated the Passover with his disciples the night before he was betrayed. Again it is no coincidence that Jesus instituted another celebration that is to be celebrated for “generations to come” as he gave his disciples the first communion feast. An analysis of the content of the Gospels indicates that about one-third of the Gospel accounts are parables. Aside from their theological importance, parables shed much light on life in the New Testament era. Except for the Egyptian papyri, which emphasize life in Egypt, the parables are the best source of information about life in the Near East in the New Testament era. They reflect the innate love of graphic, pictorial speech and the great delight in a story, which is still true of life there today. Jesus’ parables demonstrate everyday experiences and events in the world of nature. Since Jesus’ hearers would not listen to him on his terms, that is, the true meaning of the kingdom of God as revealed in Scripture, Jesus then began to speak to them in parables. His hearers had an innate love for graphic stories and pictorial speech. Jesus used this appealing parabolic approach to catch their attention and to seek to get them to ponder the true meaning of what he said. As people wondered and pondered what Jesus was telling them in his parables, the Holy Spirit could work in their hearts, seeking to lead them to the proper Biblical understanding of His message. In time, as the Spirit penetrated the hardness of the heart, hearers could grow in understanding of the true meaning and nature of God’s kingdom and of life in the kingdom. Crucial in this was the Spirit leading them to understand who Jesus truly is in His ministry and teaching as the fulfillment of the prophecies in his person and work, and its decisive implications for their life as members of God’s covenant people. From The Concordia Journal July 1990 p.248-249. Dr. Kiehl continues in his article to develop the skills of determining what Jesus actually meant when he told his parables. He warns us not to try to put our own meaning into the parables but to strive to find the true meaning, the one that Jesus meant for us to have. This is no easy task, especially when Jesus does not explain the meaning of the parable. Don’t worry too much if some of this flies over your head. The main point is not to force our own thoughts and insights on the text and miss the true point of the parable. When in doubt, pray, meditate, or ask your pastor if you don’t fully understand. Well, better late than never. I got so busy yesterday I totally forgot to post this weeks study, so here it is a day late. Hope this wasn't a problem for you this week. There are others that we could talk about but these are the big ones. I will be highlighting some more typology as we go this year. Let me know what you think about typology. Remember you can't always say that something is a “type” of Christ, but if you see something that you may think is let me know and I will do some investigating for you. We read a few more parables of Jesus as well as read about some miracles including the feeding of the 5,000 and just as amazing, the feeding of the 4,000. One of the most powerful passages we read came in Ch. 16. Peter’s confession of Christ is a powerful witness to the divinity of Jesus and his claim to be the Messiah. After hearing Jesus preach and witnessing his miracles he boldly professes, “You are the Christ (Messiah) the Son of the living God." Either Peter was crazy or he was convinced that this simple man from Nazareth was the promised Messiah. PURPOSE: The Lord reintroduces Himself to Israel, rescues them from Egypt, and gives them a covenant of laws and sacrifices. LAW THEMES: Plagues against unrepentant Egypt; God gives the Ten Commandments and requires an oath to fulfill the Law. GOSPEL THEMES: God remembers and fulfills His promises to the patriarchs; atonement through sacrifice. I’ve been behind the wheel in Ollie’s place before; how ‘bout you? Unfortunately, there is something about driving on California roads and getting angry that seems to be a natural fit. Let’s just say, I bet many of us are glad it was Ollie and Harriet, not us, who were filmed behind the wheel. Ever had your health or your hopes hit a huge pothole leaving you flat and struggling to make it down life’s highway? How about the Designer of life’s journey? Have you ever felt as if God has removed any and all directional signs and left you driving solo, free-wheeling it, so to speak? You’re talking but it seems no one is listening; you’re listening but it appears He ain’t talking. You are left to stew because you believe God has left you. So, who hasn’t shaken a fist from behind the wheel? Then, as those who desire to live the Golden Rule what ought we to do with our anger? 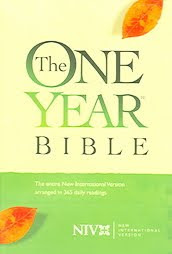 Read the story of Joseph, if you are following the One-Year Bible that is exactly where you are right now. It is found in Genesis 37-50. Jacob or Israel as he is also known has 12 boys; but one is the apple of his eye, a chip off the old block, daddy’s boy, and father’s favorite. That one is named Joseph. He shares his vision with his brothers about his place of primacy and leadership among them. They toss him in a hole and finally sell him into slavery, then report to their father that this favored son of his has been killed. Joseph serves as a slave, is wrongly condemned, and imprisoned. He then rises to the place of national prominence and leadership in Egypt, unbeknownst to his brothers. Joseph is the official his brothers stand before seeking assistance for the family facing starvation back home. Then, finally revealed to them as their long “lost” brother, Joseph and his family are restored. We’ve all had brothers, be they our brothers by blood or spirit, who are snide, snotty, condescending, and self-absorbed know-it-alls. We’ve all known brothers, be they physically or theologically related to us, who are vindictive, jealous, and rash. We’ve all had brothers with whom we, like they, have the “right” to be angry. There is such a thing as righteous anger. Righteous anger does the right thing; unlike taking a father from a son or son from his father. Anger, even righteous, is never an excuse to do the wrong thing; like betraying and selling off said brother. Cruelty, brutality, and injury these cannot be justified as results of our anger. Sin is sin regardless of the soil from which it springs. There are both civic and societal consequences to sin. We can both allow them to take place and even pursue them with clear conscience within the framework of the Golden Rule. Joseph allowed his brothers to worry, for a time. He allowed them to conjure up all sorts of potential results and endings to their unexpected encounter. In order to lead them to repentance, not in order to get even! Forgiveness does not equal ignorance or lack of remembrance; nor does accepting all people mean approving all behavior. Joseph told them that what they did was evil, and intended to be such, but God worked it for good. So having gone through that story we should get back to the question: How do we deal with anger as those who seek to live by the Golden Rule? Maybe another question can provide us with an answer. How does the One who gave the Golden Rule deal with His anger? Make no mistake about it, God has been angry. His anger is always righteous, for He is always righteous. God’s wrath is never at a sinner – rather it is always at sin. God never seeks to get even nor does He ever throw a tantrum. You know what God does with His anger? He drops it on Jesus. God pours out the fullness of that anger, the fullness of His wrath toward sin, the world’s, our “brothers” and our own on Jesus, so that He might be reconciled to us and we reconciled unto Him. There are many ideas about how to deal with anger from counting to 10, to taking a deep breath with a slow exhale, to writing a letter, to talking to a therapist or counselor; each valid and helpful to many to be sure. Here is one more suggestion for your anger, what if you do with your anger what God does with His? Leave it at the cross. God placed His on Jesus’ soul! Why not leave yours at Jesus’ feet? Rather than shaking a fist full of blame, accusation, or spite take your anger to Christ, who is your brother, with an open palm and let him clench his hand around your anger and begin to take it from you. God was satisfied fully in one fell swoop, we call it Good Friday. It might take you once a day, every day, three times on Friday if you’re driving LA/OC freeways…yet, when angry why not take a journey to a hill far-far away, and do with your anger what God did with His…leave it at the cross? Click on this link: YouTube - Aladdin Meets Old Man Jafar. Jesus, who doesn’t go for half measures, completes the ancient teaching with the words, “Do unto others as you would have them do unto you.” In the case of Jesus those final words of Jafar, “Things aren’t always what they seem” are true. Why does Jesus change the ancient instructions to us? --> From: Not doing what we wouldn’t have others do. --> To: Doing to others what we would have them do for us. Isn’t the former enough? It would keep us safe, keep society in check, and reduce fear if it were fully lived out. Yet, the latter would enable us to experience selfless giving and unconditional loving – which are at the core of the actions of Christ and the heart of God. As we do unto others they receive and experience the love of God in Christ. In seminary I took a class called Biblical Theology and Exegesis. Don’t get too impressed. I am convinced that theologians want to sound smart, so they use technical names for most of the classes. For example I have taken Hermeneutics, Homiletics, and Old Testament isagogics. In regular English that means I took Bible study, preaching, and Old Testament history (I hope I didn’t give away any company secrets). Anyway, part of Biblical Theology and Exegesis is seeing the whole story of the Bible. My textbook gave this definition, “Biblical theology is principally concerned with the overall theological message of the whole Bible. It seeks to understand the various parts in relation to the whole.” This is exactly what I try to do each week with our studies. I guess I didn’t even know that I have been teaching a class in Biblical Theology every week on the internet for over five years. Well, I hope that through these studies you will start to see the whole picture and the overall theme of God’s Word. At the end of the first chapter of my textbook it says, “The Bible is about humankind falling into sin, and God’s determination to put things right. It is about salvation, God’s rescue plan for human beings under judgment. It is about the worship of the one true God and the rejection of the gods that fail.” Lets all try to keep this in mind as we journey in God’s Word together. The opening stories of the Old Testament revolve around what we call the Patriarchs. This includes Adam, Noah, Abraham, Isaac, Jacob, Joseph. The first week of the year we sped through many generations as well as many years but this week we have been focusing on one family. This family has some issues. Jacob is encouraged by his mother to pretend to be his brother so that Isaac will give him the family blessing. If this sounds dysfunctional you are right. We will see plenty of dysfunctional behavior in the Old Testament. Remember the Old Testament is setting the stage for the coming of the Messiah, the one that was to save the people. Just wait until we get into the book of Judges and then we will see some real dysfunctional behavior. That PLR (people, land, relationship) promise that we talked about last week comes back (in whole or in part) quite often. We saw it multiple times this week. Each time I read it I put the letters PLR in the margin. I hope you begin to see that this is an important promise. This becomes the foundation for all the other promises that God will make in the Old Testament, including the coming of the Messiah. We read about Jacob and his rather strange relationship with his father-in-law, and then his odd relationship between him and his bickering wives. Once again we see some facets of dysfunctional behavior, but we also see that God will be faithful and keep his promise. The story of Joseph is one of the longest stories in the Old Testament. I will have more to say about this story later. For now be sure to catch all the details and see if they remind you of any other stories in the Bible. Perhaps some of you are familiar with the Andrew Lloyd Webber musical called Joseph and the Amazing Technicolor Dreamcoat. This musical is a pretty faithful rendition of the story and if you get confused you may want to rent the movie version. It stars Donny Osmond (don’t let that scare you) and has an appearance by Joan Collins (don’t let that scare you either). In our readings from this week we find that Jesus still continues to teach, and heal and now he is starting to generate some interest. John’s disciples start to question him about things and we get a deeper glimpse into the ministry of Jesus. Chapter 10 has some interesting things to say about going out and speaking about Jesus, but remember that Jesus was speaking to 12 Jewish men in Israel almost 2000 years ago. It can be dangerous to make some one for one comparisons with these teachings and today. One very interesting section in our reading is found in chapter 12:13. Jesus uses some Old Testament stories to bring light to his earthly ministry. He gives us some clues about the end of his earthly ministry as he compares himself to Jonah. This is a fascinating passage for theologians as it sheds light not only on the work of Jesus but also the reason that the book of Jonah is in the Old Testament. For those of you at Bethany, we will be studying the book of Jonah this Lenten season. In that study we will explore this relationship ever further. Jesus also says that he is greater than Solomon. This was a big claim because no one was a wise as Solomon especially in the eyes of a Jewish person. It is also another place that shows the relationship between the Old and New Testaments. One thing I think I forgot to mention last week. Every time you read the word LORD (in all capitals) in the Old Testament, the translators are saying this is the proper name Yahweh. It is God’s personal name. Remember that Moses is the one writing the first five books and he was the one to whom God revealed that name. So it makes sense that he uses it in his writing. Another thing I want to point out to you is the use of names. Names are important in the Bible. like I just said above LORD is translated from Yahweh which means “I Am who I Am”. It sounds rather nebulous to us but how could you try to contain God in a few letters no matter what language it is in. On to my point, we have seen quite a few names, the names of people and places. If you are reading through the NIV or the ESV you will notice that every time we encounter a new name there is a footnote. If you follow those footnotes you will find some more information about the name. For example, when Isaac was born we read in the footnote that Isaac means “he laughs”. Some of these names have some theological significance. The name Jacob means “he grasps the heel” which is an idiom for someone who deceives which is just what he does to his brother twice. Later in the story we will get to Joshua. His name means “the LORD saves”. This is the same name that is translated as Jesus in the New Testament. Makes sense doesn’t it. The phrase Jesus Saves is almost redundant. I will try to point out some of these names when they come up but feel free to follow the footnotes to get some more information. That is about all for now, but one word of encouragement. If you get behind in your reading don’t try to catch up all at once. Just double up your readings each day and soon you will be back on track. The other option is to just let some of the readings go, like water under the bridge and just pick up on the current day. Either way you are still in the Word, and that is a good thing. Have a great week and look for a new post next week!! Do you remember the old Saturday Night Live sketch entitled, “Land Shark?” It went a little like this, someone was reading on the couch when the door bell rang. “Who is it?” Then, a muffled response from the outside the door was heard “Candy-gram.” “Do they send those anymore?” “Ahh…” you would hear the muffled voice offer followed by, “Pizza-man.” “I didn’t order a pizza.” “Special delivery” the voice would then reply. “You’re the Land Shark” the resident would assert. “No, I’m a harmless dolphin.” the muffled voice would assure the nervous resident. “Oh, I love dolphins!” Of course, we all knew what was coming; the door would fling open wide and the “Land Shark” would devour its prey. You didn’t need to see what was on the other side of the door to know it was a danger. How often have we opened the door to that which we know intends us harm because we have allowed ourselves to be fooled into thinking it is ok? Rage shows up asking for admission and we give him a space on the couch then let him spew, vent, and rant. Get Even wants to mull things over and we pull up a chair; consider his words and allow his plans and plots to unfold in our minds. Pity wants to have a party so we show her the kitchen, show her the liquor cabinet, and join her lament. Immediately following their victory in this year’s Rose Bowl the TCU quarterback had “I told you so!” ringing on the bell of his heart. The reporter mentioned how they had not been given much respect as a non-AQ (automatic qualifier). Of course, many thought they didn’t belong in a BCS game at all and just as many thought that Wisconsin would wipe them out. Do you hear what is ringing the bell of his heart? Listen again. Is it “I told you so?” Here it was his chance to cast aspersions. They just went undefeated; his chance to rub it in BCS faces, “Who says non-AQ teams aren’t as good as major conference ones?” It was his chance to elevate himself, “Well, I played great. I really took charge. I made all the difference.” Know what I heard instead? I heard a young man who was practicing the art of managing the heart. Jesus was a man whose perpetual practice was to manage His heart whether on the big stage or in private, before thousands or just one: ALL the time - EVERY time. Matthew is the reporter, but John the Baptist does the interview. Did you hear it, it was knocking quite clear: Power, Pride, & Position – the ‘trifecta’ of temptation if you will, attempted to enter Jesus’ heart. Jesus managed His heart. Over and over again we hear knocking on the door of Jesus’ heart that which would detour Him from His calling. Rightful Recognition and Rule in the crowd wanting to make Him King; Loop Hole and Easy Way Out in the voice of Peter; It’s About Time in the offer of the crowd before the cross. Each and every time Jesus managed His heart. Our hearts, unlike Jesus’ are by nature impure. Cholesterol is not the greatest threat that fills our hearts. Sin is! Our hearts are loaded with it, sinful guilt that is! So, Jesus managed His heart in purity that He might redeem your heart and mine. Your heart is PURE because Christ is PURE! When you were Baptized, Jesus made your heart His home and He moved in with purity! Greed, lust, arrogance, and pride each was drowned in the waters of Baptism and each was given its eviction notice. Now you are pure as He is pure. The problem is that those very things which were drowned keep rising to the surface don’t they? And like the Land Shark in the Saturday Night Live sketch, those very things evicted keep ringing the door bell trying to gain admission to our hearts once more, don’t they? The solution is found in Baptism. In Baptism comes an eternity of forgiveness and grace. Through it we have been declared to be the children of God with whom He is well pleased, those who are pure in heart, even Christ pure. Baptism also comes with a daily dose of equipping power to be who God has declared you to be. Make no mistake, we will never be ‘actively’ pure this side of eternity – sin will always be a part of us and temptation will always be just that to us – tempting. Yet, eternity sees us already as those that are pure. We’ve been declared so, through faith in Christ and the gift of Baptism – so in response to that gift – we will be who we are. How ought we to start? We should start by managing our hearts through the gift of Baptism, by seeking the daily dose of the Spirit’s guidance and power that came therein. What might that look like? Perhaps like this: We just finished Christmas and church was packed service after service. Should Apathy knock on the door of your heart calling itself Common Sense saying things like, “Obviously, there is no need to share the Good News of Jesus? Apparently everyone knows it because over Christmas you couldn’t find a good place to park and there were strangers in your pew. So why go through the trouble of inviting someone to church?” If such comes knocking on the door of your heart, shut the door! Manage your heart and don’t let Christmastime familiarity of our community detour your witness to Christ; SHARE INTENTIONALLY. Sunday night we burned our congregational mortgage. Now if Greed, comes in the name of You’ve Done Your Share, or Eat, Sleep, & Be Merry, or Your Stuff Is Your Stuff comes ringing the bell of your heart saying, “The church doesn’t need as much of your stuff as it use to. Slow down on the giving thing and re-allocate to your fund, to a fun account.” Manage your heart. Don’t let need determine your offering, rather GIVE PROPORTIONATELY. After all “first fruits” means first fruits whether the collective bushel is at the bottom or to the brim. When a “Land Shark” comes ringing on the door of your heart, how might the Bethany Blueprint be a daily dose of Baptismal power that helps you manage your heart? We are ten days into the New Year and I hope your reading plan is going well. Each week I will kick off our study with a short thought or some general words of encouragement. This week I want to give you some information about how our weekly studies will be arranged. Each week I will give you my thoughts on the week’s readings. I will not be commenting on all the readings but I will be giving some general comment as well as highlighting specific passages and trying to make some connections for you. My quotes from the readings will almost always be from the NIV. Please don’t get discouraged if I don’t write about certain parts of the reading. You can always ask me questions via the comment section or via email. 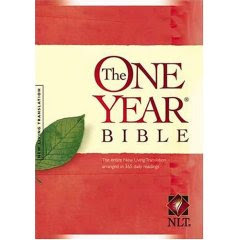 If you want some more detailed comment on a particular reading you can visit The One Year Bible Blog (www.oneyearbibleblog.com). I visit this site regularly to get some insight as well. 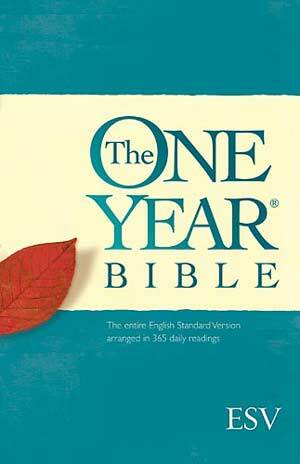 The readings for The One Year Bible are in audio form on the internet (the NLT version only). You can download these readings to your ipod or other mp3 player. You can also just listen to them on the net. Information for this can be found at www.bibleonradio.com. Like any good book the Bible begins with some great storytelling and some drama. The reason for the whole book is right there at the beginning. Because of mans fall and the steadfast love of God, a series of events takes place that will have an impact on the world and all humanity forever. In fact, the first promise of a Savior is found in Genesis. “And I will put enmity between you and the woman, and between your offspring and hers; he will crush your head, and you will strike his heel" (Genesis 3:15 NIV). The story of God’s love continues with Noah. God saw how sinful the world had become so, in his love, he destroyed those who disobeyed yet saved Noah and the promise of his love became more fully known. One of the great Old Testament words we see early on in Genesis and will have great meaning later is the word we translate as “remember”. God remembered Noah, he remembered his promises to Abraham; later in our story God will remember his people in Egypt and in exile. He will remember his promise from Genesis and send a savior for the world. After God dispersed the people at Babel, he called one man, Abraham and gave him a promise. We will come back again and again to this promise. It is a three-fold promise that I like to call the PLR promise. We first see it in Genesis 13, but it will come back over and over again. The promise is that God will make Abraham into a people, a nation set apart, he will give them land, and he will have a relationship with them (PLR = people, land, relationship). This three-fold promise will not be fulfilled in Abraham’s day. The only piece of land he will ever own is a grave. But this promise will be fulfilled as the story continues with the people of Israel under the leadership of Moses and Joshua. It will be expanded in the New Testament era as we are all called to be God’s people, our land is in heaven, and we have a relationship with Jesus because of the empty tomb. One thing to keep in mind while reading through the Old Testament narrative is that you need to try to keep the characters straight. Think of it like a program at the ballgame or the theatre. If you need to write down the characters and how they are related that might help out. This brings me to my first point about context. If you missed the fact that Lot and Abraham are related, you don’t quite get their relationship. Abraham loves his nephew so much and that relationship enters in to his decision making process. Also, two times Abraham tells others that Sarah is his sister and at first it looks like he is flat out lying but in Chapter 20 we find the following passage, “Besides, she really is my sister, the daughter of my father though not of my mother; and she became my wife” (Genesis 20:12). Now this may seem gross or unthinkable to us but remember we need to read this within the cultural context of the day and this sort of thing was O.K. It can be dangerous to impress our 21st century American culture upon a people and a land far remove in time and place and make judgments. This sort of thing will come up again and we must place ourselves in the culture of the day to understand. We don’t have to like it, heck there are a lot of things in the Bible I don’t really like, but it is God’s Word. The first thing I need to say about reading the Gospels is that they are not always written in chronological order. I hope I am not sacrificing any sacred cows for you with this but it is difficult to put a time line and chronology together when looking closely at the text. For example, in the book of Luke Jesus seems to be jumping all over the place in Nazareth and Judea. One moment he is teaching by the sea of Galilee, the next moment he is in Jerusalem, and then he is back again. Many scholars (and I agree) tend to see the Gospels written from a thematic point of view. They take the stories and events and use them to not only tell the story but to highlight certain events. Taking a look at the Gospel of Matthew we see that it was written to a Jewish audience. How do we know that? First of all Matthew was a Jew so it makes sense to write to an audience that he knew. Secondly, Matthew places the events of Jesus ministry into an order that the Jews would see as very interesting. First of all Matthew tells us that the baby Jesus was taken to Egypt. Right after the family comes back from Egypt, we get the story of the baptism of Jesus then immediately to the desert for 40 days. A Jew of Matthews day would immediately see the connection to the Exodus story of the people coming out from Egypt and going through the waters of the Red Sea and then into the desert for 40 years. It is no coincidence that Matthew uses this series of events to bring a greater meaning to his Gospel to the Jews. A casual, non-Jewish reader might miss this connection. Matthew also leans on many of the Old Testament prophecies that his audience would be well aware (especially in the birth narrative). As you read in Matthew try to remember his audience of the first century and try to see how we can gain even more understanding by studying the book as a whole instead of taking parts out and studying them in isolation. Last week I gave you some helpful tips as you begin your journey and I want to repeat them here again. I know that some of you have just started this week and may have missed last weeks post. Have a great week and please don’t hesitate to contact me if you have any questions.